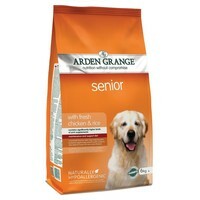 Arden Grange Senior Dog Food (Chicken & Rice) is a nutritionally complete diet for older dogs requiring extra protection against age related health problems. Made with chicken as its primary source of protein to ensure the food is easily digested by dogs that may not be the most active, Arden Grange Senior also contains significantly higher levels of joint supplements to protect their joints and relieve additional stress put on them by the ageing process. My dog couldn't get enough of this! She loves it. Good quality ingredients and a good price. Would recommend, i like that it has cranberries and probiotics in it. When I took on my rescue Springer 6 years ago I tried several foods before discovering Arden Grange, which he loves. I recently switched him to the Senior range and he is thriving - he may be getting older in dog years but still acts and behaves like a pup! Great for his health and wellbeing whilst being an ethical dog food brand. This is very good for my elderly (14) afhgan cross she is alert and sometimes able to run and chase sqirrels.